As I’ve wrapped up my recent motorcycle rally write-up, so I’ll wrap up my long-term review of my Honda Hawk GT (NT650) with this entry. In the last entry I wrote about my NT650, I had looked forward to riding it on the rally to become fully acclimated to the bike. I felt like the rally was the perfect opportunity to truly find out what the bike has to offer, to really use it for all it’s worth. It would’ve been multiple hours of being on the NT650, spanning multiple days of riding hundreds of miles – it was a proper test of the bike’s mettle, and in some ways, a test of mine on the NT650 as well. This bike is a shame. Everybody loves the underdog with heart – so much heart that it overcomes things it has no business even facing. That what it lacks in everywhere else is shouldered and carried on by its heart, and somehow gets the job done. Everybody loves that kind of story. But that isn’t the NT650’s story. The NT650 is the exact opposite of that. See, I’ve now come to realize that it isn’t right to call this bike “diminutive.” It’s only small because it was made with nothing but everything it needs to have to be a motorcycle. No frills or anything to superficially appeal – just a straight-laced, tightly-knitted utilitarian machine. 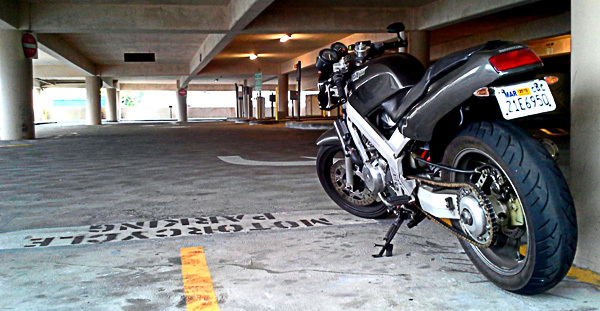 And what a utilitarian motorcycle it is, day-in and day-out ready for whatever kind of ride I throw at it. The problem is that Honda – I feel – made a motorcycle wherein the sum of all its parts could do so much more. It never ceases to amaze me to this day how this motorcycle that’s knocking on three decades old, can ride and steer like it was only made yesterday; so planted, so self-assuring and confidence-inspiring that it tackles any kind of twists or bends that any road throws at it. From the era it came from, it should feel heavy, it should feel flimsy. But it doesn’t. It remains behaved and composed every time. Where it suffers, is in its heart; the NT650’s three-valved, single-overhead cam V-twin engine. For the record, the engine itself is a trusted work-horse, firing up readily and easily at every push of the starter button as if it’s only got a few thousand miles instead of over fifty-thousand. In real-world use, it may not be excessive, but it’s fully capable and just right. But therein lies its shortcoming; this heart isn’t enough for the entire package. The bike’s engine – its heart – in the context of the bike as a whole, is its weakest link. I feel that the steering and chassis on the NT650 can do so much that every time you try to tap into them, it only serves to highlight where the engine tops out. This motorcycle’s body is too fast for its heart. Its superb chassis is literally, and figuratively, having to carry the engine to get around. To be fair, while the front forks remain OEM, the internals have been upgraded to provide progressive action and suspension damping, no doubt aiding the twin-spar aluminum frame in providing excellent feel and steering to the rider. Meanwhile, the rear shock remains completely OEM, and while it could do with some refreshing, I have yet to actually have it refreshed. So I suppose one could argue that I could make the bike’s heart stronger, give the engine an extra push, but it’s already re-jetted, running a full exhaust system, and paired with a couple of Uni Pod filters to eliminate the OEM airbox. And while drastic modifications can be done to the engine internals – balanced crank, boring out the cylinder, lighter piston and rods, etc. – I feel that on a bike, nay, an engine like this, the gains would be minimal relative to the work needed to gain them. The reality of the NT650 is that it is perfectly capable of what I need it to mostly do. It’s just that I can see and feel what potential it has, and so wish it could do what it has the potential to. It’s because it can’t as it is that it’s such a shame.